Nowadays, hundreds of compilations are released by record companies all around the world, and with one click of a button music fans have access to an eclectic selection of music that forty years ago, wasn’t available to record buyers. Back then, very few compilations were released, with the record industry tending to concentrate on artists albums. The exception was the ubiquitous greatest hits album which was a contractual obligation of an artist or band’s career. That was despite many of the progressive rock bands being more album oriented. Still a best of was compiled and released by the record companies who hadn’t quite realised the value of all the material in their vaults. For too long, the major labels didn’t realise that there was a huge audience who were willing to buy a variety of different compilations. Somehow, record company executives had managed to overlook what was a huge untapped market for everything from genre specific compilations, to compilations focusing on a specific label. Some of the more adventurous record buyers were also wanting to hear music from different parts of the world, but were denied this opportunity. The irony was that the major labels had huge amounts of music in their vaults. This ranged from the music released on both sides of the Atlantic, and by the label and their various imprints around the world. With untold musical riches waiting to mined, and the major labels had the personnel with the expertise to compile compilations aplenty some record labels were sitting on a goldmine. It was the equivalent to finding one of Charlie Wonka’s Golden Tickets. However, the major labels didn’t seem to have a sweet tooth, and seemed reluctant to embrace the compilation market. While some compilations were released, others were of dubious quality, and released on budget labels. Especially those dreadful Top Of The Pops compilations where session singers murdered the hits of the day. There were also compilations that were marketed on television, and promised “twenty hits of the day”. What they omitted to mention that shortened versions of the songs were often used so the promised “twenty hits of the day” would fit on one LP. To rub salt into the record buyers wound, usually, the vinyl was poor quality, and the listening experience wasn’t the best. This was what the compilation market was like in the seventies, which certainly wasn’t a vintage time for compilations. Thankfully, the compilation market is very different nowadays, and literally hundreds of compilations are released by recorded companies worldwide every week of the year. While there are still a few compilations of dubious quality being released, the majority are lovingly curated by knowledgable music lovers who are experts in a particular musical genres. This can range from Afrobeat, avant-garde, country, Latin, Northern Soul, progressive rock, psychedelia and zydeco. Quite simply, nowadays, there’s something for everyone in the burgeoning and vibrant compilation market. A recent release is Habibi Funk: An Eclectic Selection Of Music From The Arab World which was recently released by Germany Habibi Funk. It features sixteen tracks from Algeria, Egypt, Lebanon, Morocco, Sudan and Tunisia. Four of these tracks have never been released before and make their debut on Habibi Funk: An Eclectic Selection Of Music From The Arab World. This compilation offers a fascinating insight into what will be hitherto unknown world for many music fans, that of Habibi Funk. Many people, including a number of ardent music fans may not have heard of Habibi Funk, and be wondering about the history and roots of the genre? Habibi Funk is essentially a term given to a sound that became popular throughout much of the Arab world, including Algeria, Egypt, Lebanon, Morocco, Sudan and Tunisia. Across this vast, sprawling continent, music lovers embraced and shared a love of Habibi Funk. It’s a genre which has been inspired by a variety of disparate genres. Some of the Habibi Funk music shares much in common with Arabic zouk music, whose roots can be traced to the Caribbean Islands, including Martinique and Guadeloupe. However, Habibi Funk has been inspired by Coladera, which is popular musical genre from the Cape Verdean Islands. 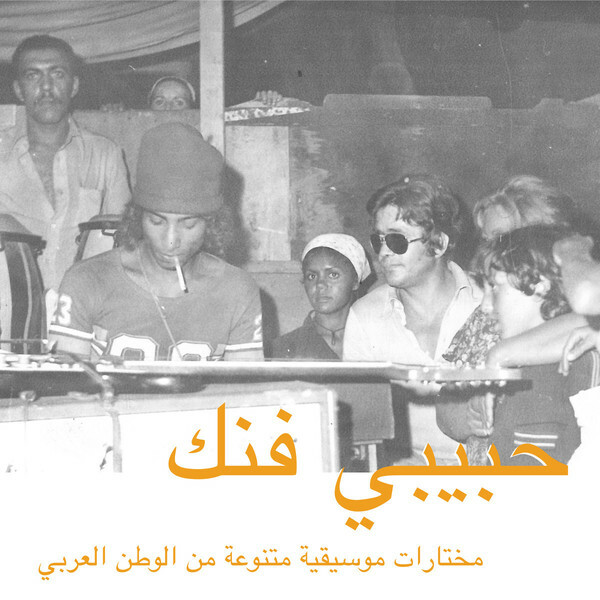 It seems that Lebanese Bossa has also played its part in the evolution of Habibi Funk. So too, has a variety of a Western genres, including funk, soul and rock music. All these genres have influenced the development and evolution of Habibi Funk. Essentially, Habibi Funk is a fusion of musical influences from four continents, which have all played their part in the irresistible music on Habibi Funk: An Eclectic Selection Of Music From The Arab World. Obviously, the music is funky, but it’s also soulful, raw, raucous and sometimes rocky and sassy. Especially when flamboyant frontmen strut their way through songs delivering vampish vocals that are far removed from the lazy, predictable cliches that James Brown used to spout during parts of his career. This is very different, and a refreshing alternative that will introduce the newcomers to fifteen heroes of Habibi Funk on Habibi Funk: An Eclectic Selection Of Music From The Arab World. These heroes of Habibi Funk come from six Arabian countries, including, ranging from Algeria, Egypt, Lebanon, Morocco, Sudan and Tunisia, and including Fadoul, Bob Destiny, Attarazat Addahabia, Sharhabeel Ahmed, Belbao, Mallek Mohamed, Freh Kodja, Ahmed Malek, Al Massrieen and Dalton. They’re just a few of the names on Habibi Funk: An Eclectic Selection Of Music From The Arab World. Moroccan funkateer Fadoul who opens the compilation with Bsslama Hbibti, is regarded by many as the founding father of Habibi Funk. This is a track from his Al Zman Saib album which was released on the Atlassiphone label. Bsslama Hbibti finds the flamboyant vocalist Fadoul fusing funk, soul and rock during this irresistible track that sets the bar high for the rest of Habibi Funk: An Eclectic Selection Of Music From The Arab World. Although Bob Destiny was born in New Orleans, the singer, theatre director and choreographer spent time working in Algeria where he released a handful of singles. This includes Pan-African Festival for the Freedom Musique label. Tucked away on the B-Side was an explosive, energetic and later vampish cover of Wang Dang, that seems to have been inspired by the early rock ’n’ rollers and R&B singers. The result is a timeless tack that even today would fill a dancefloor. Attarazat Addahabia’s contribution is something of a mystery, as the title is unknown. Despite that, the Arabian, Western and even a hint of classical music to create a funky, urgent and soulful song that features an impassioned vocal from Attarazat Addahabia. It shows another side to Habibi Funk. While Jalil Bennis Et Les Golden Hands were from Morocco they released Mirza as a single on the French label Barclay, in 1967. It’s a genre-melting track with elements of garage rock, R&B rock ’n’ roll and surf music. They’re combined to create a lively and dynamic cover of this Serge Gainsborough composition. In Sudan, Sharhabeel Ahmed is still regarded as a legendary figure within the country’s art scene. He’s remembered by many as the founding father of Sudanese jazz. However, Sharhabeel Ahmed was a versatile and talented musician, who could play several instruments. This included the guitar, and he’s a versatile player who deserves to be called a virtuoso. That is apparent on Argos Farfish, where his playing hints at Jimi Hendrix, before a genre-melting arrangement unfolds and Sharhabeel Ahmed, forever the flamboyant frontman, swaggers his way through the lyrics to a song that epitomises everything that is good about Habibi Funk. Every self-respecting record buyer knows the Harlem Shuffle, which is considered to a soul classic. However, very few people will have heard of the Casablanca Shuffle. It was recorded by Belbao from Morocco, who pay homage to the Harlem Shuffle, by changing the lyrics slightly and the Casablanca Shuffle is born. Mostly, Belbao stay true to the original song, but sometimes, takes the Casablanca Shuffle in a new direction, breathing new life into a familiar song. Mallek Mohamed was born in Algeria, but travelled to Paris, France where a new chapter in his career was born. This musical pioneer set out to break down musical barriers, by fusing disparate musical genres. In doing so, Mallek Mohamed hoped his the music he wrote and recorded would find favour with a wide range of people. Sadly, much of the expressive and poetic music that he wrote, including Rouhi Ya Hafida, was never released by a record label. That is a great shame as his vocal is full of expressive, emotive and full of longing as he delivers the poetic lyrics against a disco beat. This shows yet another side to the Habibi Funk sound. While Freh Kodja was born in Algeria, his career took him all over the world, including Europe and America where he worked as a solo artist and with the band La Flamme. Freh Kodja contribution to the compilation La Coladera, where he sings call and response with backing vocalists. They play their part in a soulful, funky, urgent and irresistible track. Nowadays, Kamal Keila is regarded as one of the legends of the Sudanese music scene in the seventies. Sadly, he only released one album which is extremely rare. However, he also recorded several sessions for Sudanese radio. During one of these recording sessions he recorded Al Asafir, which is a captivating fusion of soul, funk and jazz, plus Sudanese and Ethiopian music. There’s also a nod to Fela Kuti during this funky, soulful and heartfelt song. Algerian vocalist Ahmed Malek is the only artist to feature twice on the compilation. His first contribution is the dramatic, cinematic and stirring Tape 19.11 which incorporates elements of Algerian music, funk, jazz. Very different is Bossa, which shuffles along showcasing a much more laid-back and melodic sounding track where jazzy horns add the finishing touch. Hamid El Shaeri who was born and brought up in Egypt, was one of the biggest stars of Arabian pop between the eighties and noughties. He was a versatile artist who released everything from boogie, disco and soul. A reminder of this is the feelgood sound of Ayonha a gorgeous fusion of boogie, modern soul and pop. During the eighties, Samir and Abboud entered By Pass Studio with a band the featured the cream of Lebanese music. During the session, the pair recorded a number of tracks including Games, which is reminiscent of the Yacht Rock and Vanilla Funk sound. It’s a real hidden gem and welcome addition to this truly eclectic compilation. When Al Massrieen set out to modernise Egyptian music in the late-seventies, nobody had any idea of what was about to unfold over the next few months and years. Using the latest in musical technology, including synths, drum machine and even early computer programs, Al Massrieen came up with tracks like Sah. It’s essentiality a fusion of boogie, disco, jazz and soul that was the result of Al Massrieen rewriting the musical rulebook. As Lala Tibki unfolds, straight away, Gharbi Sadok and Georges Garzia sound like a Tunisian equivalent of Steely Dan as they combine jazz, funk and rock. The result is a slick, soulful and memorable song that isn’t short of a hook. Closing Habibi Funk: An Eclectic Selection Of Music From The Arab World is the smooth and soulful ballad Soul Brother from the Tunisian band Dalton. They were based in the Tunisian capital, where they were regulars on the local music scene. That was where they heard the soul and funk that went on to influence their sound. One of their finest recordings was Soul Brother, which was the B-Side of their 1975 single Aleck. It closes this lovingly curated compilation on a high. For music fans who have yet to discover either modern Arabian music or Habibi Funk, then Habibi Funk: An Eclectic Selection Of Music From The Arab World is the perfect introduction to this genre. It was recently released by Habibi Funk Germany, and features sixteen examines of Habibi Funk, which is a broad musical church. There’s much more to Habibi Funk than funk. There’s also Arabic zouk music, Coladera from the Cape Verdean Islands and Lebanese Bossa, plus everything from boogie, disco, funk, jazz, R&B, rock ’n’ roll, rock and soul. All of this can be heard on Habibi Funk: An Eclectic Selection Of Music From The Arab World which features sixteen tracks that are a tantalising taste of the music that unites much of the Arab World, Habibi Funk. ← ASARAN EARTH TRIO-WHY SHOULD YOUR HEART NOT DANCE.